Welcome to Part 2 of our “Gemstones of the Zodiac” series. The second sign of the Zodiac is Taurus (April 21 -May 20). The Mystical Zodiac stone for Taurus is Sapphire. 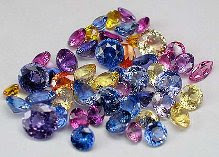 Sapphires belong to the corundum family. This is a family of gemstones that are pure aluminum oxide. Over time, heat and pressure turn these aluminum oxides into sapphires. The word “sapphire” comes from the Latin “saphirus” and the Green “sapheiros”, both of which mean “blue”. Although most people immediately think blue when it comes to sapphires, there are actually several different colors of sapphires, including red, pink, yellow and green. 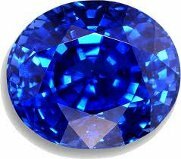 The color of the sapphire will be based on the amount of outside material that enters into the aluminum oxide during formation. Chief among those external elements is iron and chrome. You probably best know the “red sapphire” but its other name, the ruby. Sapphires date back to earliest history. There are some historians who believe that the Ten Commandments were carved in sapphire. In Ancient Persia, it was believed that the color of the sky was a result of the reflection of a giant sapphire on which the Earth was resting. Helen of Troy owned a large Star Sapphire which many believed held the key to her desirability. Even the famous “seal” of King Solomon was an inscribed sapphire. In the Medieval Times, sapphires were used as a test of fidelity. The stones were thought to change color if worn by the unfaithful. Little did they know back then that there is such a thing as a “color change sapphire”. It is very rare, but is known to change color in certain light. I wonder how many were falsely accused of infidelity by a color change sapphire? Sapphires are also a very religious stone. As stated earlier, it is said that the Ten Commandments were carved in sapphire. Charlemagne owned a sapphire amulet that signified his devotion to god. In the 12th, 13th and 14th centuries, Christian clergy began using stones to try and heal the sick. Necromancers used them to summon spirits for prophecy, and in an attempt to practice black magic. The Seventh Heaven of Islam is said to be awash in a sea of shining rubies, emeralds and sapphires. Sapphires are thought to be symbolic of faithfulness and honesty, making them a great gemstone for an engagement or wedding ring. They are also believed to be good for increasing communication, cleansing depressive moods, and bringing about a sense of peace, and a clarity of vision. This clarity of vision is why they have been a prized stone of alchemists for centuries. If you are using them in crystal healing therapy, sapphires can be used for reducing throat and breathing issues (like TB), reducing fevers, stopping nose bleeds, and regulating the endocrine glands. If you are using them in chakral work, light blue sapphires are for the 5th Chakra, and the dark blue are for the 6th Chakra. Blue sapphires are best worn during the phase of Saturn. During a Saturn/Mars conjunction, wearing a larger sapphire (over 3 carats) can help with marital happiness and financial prosperity. They can also be worn during an eclipse to offer up a prayer. They should be worn on the second finger (the Saturn finger). To get the benefit of pink sapphire, it must be worn touching the skin. This means that any pink sapphire pendant or ring, should have a cut out in back to make sure the stone is able to touch the skin directly. This stone is for protection against ill health and misfortune. Padparadscha means “lotus blossom” in Sinalhese. 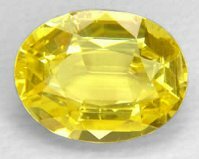 It is the only other stone in the sapphire family, other than ruby, that is known by its own name, and not as a color of sapphire. It is believed to bring a great inner peace, which leads to a greater understanding of the world around you. It is believe to help couple trying to conceive, provided one or both of the potential parents wear it in a ring. Padparadscha is a very rare form of sapphire. 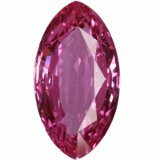 To qualify for the name, the stone must exhibit properties of both the pink and orange sapphire. They are so rare, in fact, that most of the ones seen today are lab created. 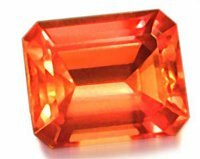 The lab created padparadscha sapphires are almost indistinguishable (except by an expert), except for the price. It is best to get this stone through a qualified gemologist. It is said that these are best to be worn on Thursday mornings, and within an hour of sunrise, to give the best results. This stone is believed to assist with the nobler aspects of life and in the occult, in areas such as spiritual motivation, meditation, yoga, preaching. For those with a birth number of 3, this is a great stone for year round happiness and prosperity. It is also believed to protect you on long voyages. Once known as the “oriental peridot” in medieval times, the green sapphire is actually a stone with alternating bands of blue and yellow sapphire. You can see the bands under a microscope. 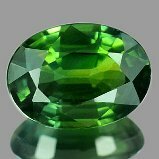 Green sapphire is also called the “stone of fidelity”, as it stimulates the heart chakra. It is also good for internal as well as external vision, which means it can aid in the ability to remember your dreams. Sapphires need to be cleansed every 15 days, together with rock crystal and amethyst. These stones are so pretty they look like some magical stones...that can change your destiny..After all zodiac and astrology is all about being unique. Nice post i must say..truely loved it.